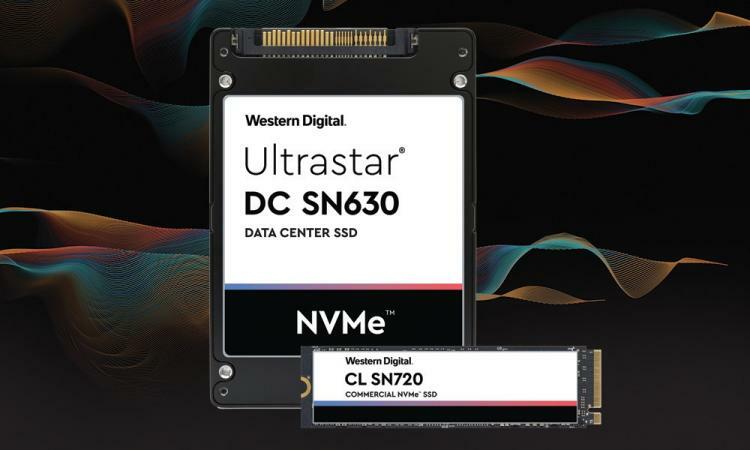 Western Digital Corp. today announced two new additions to its broad portfolio of NVMe-based systems, platforms, SSDs, and memory drives for data center and cloud customers. With a full portfolio covering applications from edge-to-core, these additions are the Western Digital Ultrastar DC SN630 NVMe SSD and the [url=https://www.westerndigital.com/products/data-center-drives/cl-sn720-ssd.html]Western Digital CL SN720 NVMe SSD. Each leverages the power of Western Digital's vertical integration capabilities, including internally developed controller and firmware architectures, and 64-layer 3D NAND technology. As a replacement for lower-performing SATA SSDs, these new NVMe drives meet the insatiable need for performance, scalability, endurance and low total cost of ownership (TCO) for public and private cloud deployments, hyperscale cloud environments, and next-generation workloads at the edge. "For our cloud and hyperscale customers, performance, economics, and endurance at scale are paramount," said Eyal Bek, vice president, data center and client computing devices at Western Digital. "The Ultrastar DC SN630 SSD and Western Digital CL SN720 SSD, both of which leverage our internally developed SSD architectures and 3D NAND, can help our customers step up from SATA to NVMe performance as they position their data centers for the future." "Our strong partnership with Western Digital brings compelling flash performance and cost innovations to the fast-growing hyperconverged infrastructure industry," said Lee Caswell, vice president Products, Storage and Availability at VMware. "The combination of new Western Digital NVMe products, optimized for cloud and software-defined storage applications, with the award-winning VMware vSAN software can improve TCO and productivity for customers building out modern infrastructure." Western Digital Ultrastar DC SN630 NVMe SSD is a 2.5-inch small form factor (SFF) enterprise-grade NVMe SSD optimized for cloud storage, which delivers more than three times the IOPS for mixed workloads compared with legacy SATA drives. The Ultrastar DC SN630 SSD enables cloud architects to increase performance for latency-sensitive workloads while providing excellent QoS. Recognizing the need for purpose-built storage with varying endurance requirements, the Ultrastar DC SN630 SSD will be available in two configurations. For mixed-use workloads, the Ultrastar DC SN630 SSD comes in capacities between 800 gigabytes (GB) and 6.4 terabytes (TB) with two drive-writes per day (2DWD), and for read-intensive workloads, capacities are available from 960GB to 7.68TB with 0.8DWD, making it ideally suited to accelerate applications, including software-defined or hyper-converged infrastructures, OLAP, media streaming, and the rapidly growing IoT segment where low latency is paramount. Western Digital CL SN720 NVMe SSD is an NVMe SSD purpose-built for the performance requirements of boot and edge applications. It enables outstanding random read IOPS performance, optimal endurance with encryption capabilities, and extended enterprise validation for server operating systems' boot and edge data center applications. With capacities from 256GB to 2TB in the M.2 form factor, the Western Digital CL SN720 NVMe SSD is designed for edge servers, content delivery networks, cloud-based gaming, and IoT platforms and gateways. Both products are based on Western Digital's BiCS3, 64-layer 3D TLC NAND technology. The CL SN720 is shipping now. The Ultrastar DC SN630 SSD is currently sampling with select customers with broad availability expected in April.